People are of two minds when it comes to the Best Pictures. I've heard people say, "More comedies need to win". However, when a comedy actually does win, the same people howl in protest. "How could Shakespeare in Love actually beat Saving Private Ryan?" I hear people say, "Popular/Hit films should win". HOWEVER, when one actually does win, again the same people become apoplectic. This is the case with The Greatest Show on Earth. "How could THAT beat The Quiet Man or High Noon?" Never mind that the public LOVED it. What do THEY know? Now, I'm willing to go ON RECORD and say The Greatest Show on Earth will never get THE CRITERION COLLECTION treatment. I'm even willing to admit it isn't AS GOOD as the other two Best Picture nominees mentioned. What I cannot and will not do is say that it's a terrible movie. It Is Not a Bad Film Regardless of What You've Heard. I enjoyed it the first time, I enjoyed it the second time, and I would watch Greatest Show on Earth over other more vaulted Best Picture winners (Gentleman's Agreement for example). I'm sorry if I sound defensive but frankly I don't understand why all this hatred for The Greatest Show on Earth. I'll grant you that it isn't the best Best Picture winner. It may be among the worst selections for the Academy Awards' top prize. However, in a case of not seeing the forest for the trees, I find a lot of entertainment in The Greatest Show on Earth, so let's look over the film itself and more fully address its win later. The Ringling Brothers, Barnum & Bailey Circus runs the risk of not having a full season, playing for only ten weeks in major markets. 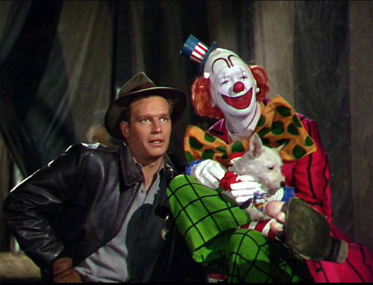 This appalls Brad Braden (Charlton Heston), the circus manager who is determined to keep the show going. He manages to do this by acquiring the services of trapeze artist The Great Sebastian (Cornel Wilde). This, however, means pushing Braden's main squeeze Holly (Betty Hutton), out from the Center Ring, which she wants desperately. Now Holly and Sebastian will be fighting it out with more and more elaborate stunts. Not to be outdone, elephant rider Angel (Gloria Grahame) knows that Brad is in love with Holly but also knows that Holly is a fool for allowing her desire for the Center Ring (and her wooing by shameless womanizer Sebastian) to dazzle her. She is patiently waiting for her chance at a play for Brad, the only decent man she knows. This, however, does not sit well with Klaus (Lyle Bettger), the elephant trainer who is in love with Angel. Despite warnings from both Angel and singer/iron jaw artist Phyllis (Dorothy Lamour), Holly wavers between her love for Brad and fascination with Sebastian. While Holly may be falling for Sebastian's charms, that doesn't stop either from trying to top the other in the air, as they continue performing more and more dangerous stunts to draw attention away from the other. Brad doesn't care all that much, for his main concern is that the circus continue to stay in the black. Observing all this is Buttons the Clown (James Stewart), friend to all who curiously never takes his make-up off, even when not performing. Over the course of the film we get hints as to why he remains 'in character' throughout: he is a fugitive a la Richard Kimble. Eventually, the on-air rivalry between Sebastian and Holly reaches a crisis point, when Holly mocks Sebastian for having a net when attempting a particularly dangerous stunt. The cocky Sebastian cuts it down...and we all know what happens when someone cuts the net from under themselves. Sebastian is not killed, but we learn when he returns that Sebastian will not fly again. Still, the show must go on. Holly had decided she is in love with Sebastian, and he with her. Seeing this as HER moment, Angel makes a play for Brad, who appears to reciprocate (well, as much as Brad can in a non-circus related situation). Klaus is outraged, so outraged he comes close to killing Angel in front of the audience with his elephants. Brad immediately fires Klaus, who now joins with shady midway booth runner Harry (John Kellogg), who had also been previously fired by Braden. Together, they decide to rob the circus train. Just before leaving for Cedar Rapids, FBI agent Gregory (Henry Wilcoxon) boards the train, asking Braden if the circus' doctor matches a photo of a doctor who killed his wife on the operating table (even though the doctor's wife was terminally ill). Braden does not recognize the man in the photo, but Buttons' proficiency with medical matters (his mastery of bandages, his treatment of Sebastian after his fall, and how he noticed Sebastian had feeling in his hand, suggesting that his injuries were not permanent) now comes into play. Braden tells Buttons that someone is looking for this mysterious man, and will take fingerprints. No time for such matters, as Klaus and Harry rob the train. However, the second part of the caravan, the one carrying the performers and animals, is heading towards the first part that is stationary. Harry doesn't care if they collide, but Klaus does. He beats Harry and rushes his car towards the train, desperate to stop it. However, it cannot, and there is a massive train collision threatening both the circus crew and the circus' very survival. Braden is badly injured, and Holly, having pieced together Buttons' true identity, begs him to save Brad, realizing that she loved him all this time. Despite the inevitable discovery, Buttons agrees. It looks like the circus will not come to town, so Holly takes charge, bringing the town to the circus by having it play in the open air. Buttons is taken into custody by a reluctant Agent Gregory, Brad acknowledges his love for Holly, and the Great Sebastian and Angel get together when he proposes to her. Phyllis, just loving it all, is thrilled to see things come together, and everyone celebrates The Greatest Show on Earth. Frankly, I don't understand the hatred thrown at Greatest Show on Earth. It should not have won Best Picture, but I found it to be a big, lavish, epic spectacle in the way only Cecil B. DeMille could make big, lavish, epic spectacles. As a film, I was surprised that despite its massive length (two and a half hours) the film moves quickly for the most part. I think that once the Great Sebastian comes crashing down to earth the film sputters a bit (the musical number Be A Jumping Jack with a duet by Hutton and Stewart--of all people--does not help, and I wonder whether DeMille should have cut that part out altogether). Despite what has been written and said about The Greatest Show on Earth, it does entertain and in some ways is a good film. DeMille and the writers (Frederic M. Frank, Barre Lyndon and Theodore St. John from a story by Frank, St. John and Frank Cavett) set up the situations well. Early in the film, the crisis of a full season and the coming of The Great Sebastian are hinted at over and over but they are held back for a bit. We also see early in the film Harry dealing with the shifty gangster Mr. Henderson (Lawrence Tierney)...whether it inspired the film Harry and the Hendersons is another matter entirely. However, in this case we see that Harry was going to play an important part in the story later on. DeMille holds back and back, allowing the anticipation to build to what we know is coming. Also, contrary to what one might have heard, there are moments of human drama in a Cecil B. DeMille picture and in The Greatest Show on Earth. The scenes between Holly and Buttons when in her naivete she wonders how Buttons' bandages are so good, or when Buttons meets up with his mother, who is forced to talk to her son as he performs for the crowds, are actually quite tender. There is also a brief moment of subtext between Buttons and Braden, when things are unspoken but are clear to both the characters and the audience. I disagree sharply with the idea that James Stewart embarrassed himself in The Greatest Show on Earth. He did a good job as the fugitive doctor in disguise, and his moments Stewart was excellent as the haunted man/voice of truth. Hutton, best known as a comic musical star, did her best as a dramatic actress. I wouldn't call it a great performance, but she made Holly into an almost endearing character, a bit naïve and sweet who could also be ruthless in her determination to get the Center Ring. Lamour was there as a bit of comic relief, and she did a great job as the wisecracking Phyllis. She paid homage to her roles in the Hope/Crosby Road movies, first by performing a South Seas number (Lovely Luawana Lady) and even by having a particular pair of hams make a quick cameo in the audience (guess who). Heston, who was making only his fourth film and first with DeMille (and had a great line about Greatest Show on Earth and The Ten Commandments...if you can't make a career out of two DeMille movies, you're in the wrong business) holds his own as the no-nonsense Braden (though I personally question the wisdom of having the character's name be Brad Brad-en). He commands the screen and we can see how Heston became a cinematic icon with his turn as the steely, determined circus manager who does his best to hide his affection for Holly. Wilde might have been the weak link in the film, coming close to a Pepe Le Pew impersonation as the Great Sebastian. I wondered why he needed to be this French cad...wouldn't an American one be just as easy to believe? In any case, Wilde is probably the most forgettable of the main characters, which is odd in that he is part of the love triangle. Where The Greatest Show on Earth excels in is in the lavish nature of the production. We've got grand costumes, grand settings (though the rear-screen projections in some scenes are obvious, I'm willing to cut it some slack due to the technological limitations of the time), and there are within it fascinating shots of how the circus manages to put things together. There is almost a documentary-like feel to The Greatest Show on Earth, and the respect the film has for the performers and roustabouts is clear. We also get great moments of seeing actual Ringling Bros. Barnum and Bailey performers be recorded (and if one keeps a keen eye and ear, we get to see famed clown Emmett Kelly without his make-up AND hear his voice). 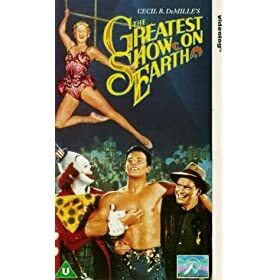 In many ways, it is accurate to call The Greatest Show on Earth 'the circus movie' because so much time is devoted to showing the performers. I can't leave The Greatest Show on Earth without mentioning the climatic train crash. Yes, one can quibble with the fact that they were models, and perhaps by today's standards it isn't as spectacular as it must have been in 1952. However, the crash still holds up rather well and provides a wild finish to the spectacle we've been watching. The effects of this moment in film history still reverberate today. The train crash in Super 8 is clearly an homage to the train crash in The Greatest Show on Earth, and the film itself was an inspiration for Steven Spielberg, who said it was the first film he ever saw. As a digression, both Spielberg and DeMille became masters of popular entertainment via film, directors loved and hated in equal measure by critics and film-goers. Steve learned quite a bit from C.B., and it appears fitting that The Greatest Show on Earth influenced the maker of Close Encounters of the Third Kind. We also have a wonderful score from Victor Young (who did such good work...the John Williams of his day, one might say). In short, I think The Greatest Show on Earth was meant to be just another film from a master of showmanship and not intended towards the lofty heights of an Academy Award-winning Best Picture. It isn't one of the best Best Picture winners. I don't even think it was the best picture of the five nominees in 1952. What The Greatest Show on Earth ends up as is a big, lavish, epic spectacle, seeing its only reason for being to entertain, to amuse...not unlike the circus it chronicled. Haters and cinema purists may sneer at both Cecil B. DeMille and The Greatest Show on Earth, but for myself, I still continue to love the circus. Please visit the Best Picture Retrospective for reviews of all Academy Award Best Picture Winners. I've often looked for myself in the movie, as I was later told we'd sat next to the entrance from which all the performers emerged - but never found myself or my parents. In fact, the "audience" appears to be heavily populated by very well-dressed people with very "character" faces, so I have to wonder if it was reshot in Hollywood later. Good memories. Thanks for helping bring them back. You're welcome. It must have been wonderful to be at the circus, and now you're not just able to have wonderful memories but appreciate that you got to see big stars like Dorothy Lamour in person! I urge you to record your memories on paper or on video if you haven't already, so that they'll be a record of people who witnessed the making of this epic film.